Danigala Maha Bandaralage Randunu Wanniya, chief of the ancient Danigala Vedda tribe, needs chemotherapy treatment or he will soon die of cancer. Danigala Maha Bandaralage Randunu Wanniya and family at Rathugala in happier days, ca. 1993. (Bibile, 17 September 2004) The chief of the ancient Danigala Vedda clan, Danigala Maha Bandaralage Randunu Wanniya, is reported to be dying of throat cancer. With little help from outside the beleaguered Danigala community, the ailing Vedda elder has been sent in circles from one district hospital to another, from Badulla to Ampara to Kandy and back to Badulla. Doctors at Kandy General Hospital's cancer ward say that the Vedda chief's life can be saved if he can be treated with chemotherapy, the drastic last resort for cancer patients. But, they say, treatment cannot begin immediately because of the long queue of other patients there. The month-long wait, however, may be fatal for chief Wanniya, whose condition is worsening from day to day. Observers have wryly noted that the better-known Dambana Veddas, who have agitated publicly and pressed cases in court against successive governments, have lately become the favorites of politicians, government departments, and the public. And yet other ancient clans, like the Danigala and Pollebedda Veddas who have accepted the government's edicts without question and without loud complaint, continue to languish in obscurity and neglect. "This Government is well disposed towards the Dambana Veddas, but it turns its back on the Danigala Veddas when their aged chief is in dire need of chemotherapy treatment," notes one observer who is close to both Vedda communities. Only a few weeks ago, an international film crew spent three days in Dambana making a documentary for German network television highlighting the plight of the Dambana Veddas and their recently improved relations with the Wildlife Department. 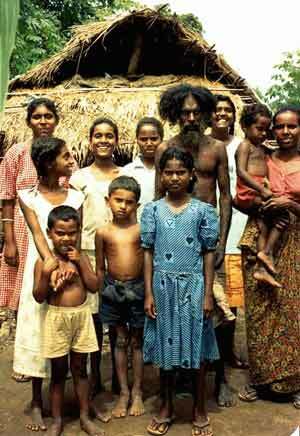 Yet the plight of other endangered Vedda communities like that of Danigala go unnoticed and ignored by the Government and public alike. 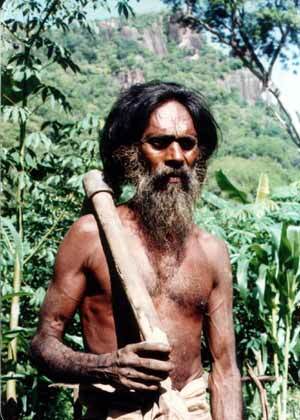 Chief Wanniya, now 70, and his sister are said to be the last humans in Sri Lanka who were born and raised in a cave. The ancient Danigala clan had inhabited the Danigala Cave near Bibile since time immemorial. "When I was young there were 24 Vedda families living there in Danigala. Then a generation ago some disease like diarrhea killed most of us. Within a few years we were reduced to only two families," said Chief Wanniya in an interview last year.